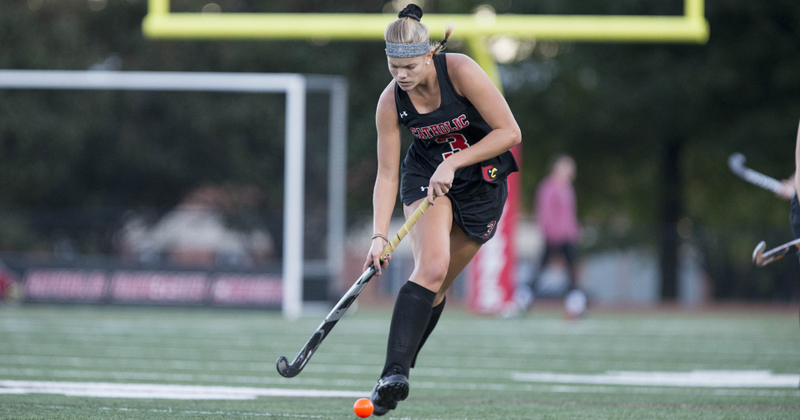 The 12th ranked CUA Cardinals’ Field Hockey team continued its dominance as they secured a 4-0 road win over the Goucher Gophers this past Wednesday. The team’s 6th straight win keeps the Lady Cards’ record a perfect 4-0 in Landmark Conference play (10-2 overall), keeping them tied atop the conference table with Scranton. The Cards wasted no time getting on the board as sophomore midfielder/forward Katie Anderson potted her first of the game off a pass from senior Marisa Martinelli. The lead was advanced to 2-0 when sophomore Alexa Guittari scored an unassisted goal in the 27th minute, where the score would stay until the half. Martinelli, who is the reigning Landmark Conference Defensive Player of the Week, and the other members of the CUA defense played like a brick wall, leaving the Gophers with a dismal 5 total shots and only one on net. Catholic immediately took over the second half when Anderson netted her second and final goal of the game only 29 seconds into the half on an assist from freshman Meghan Shallow to advance the lead to 3-0. The second half would stay relatively quiet despite the initial fireworks until the 46th minute, when rookie Grace Olson scored the fourth and final goal of the game, giving the final score of 4-0. The Cardinals dominated the Gophers in almost every statistical category. Catholic boasted 13 penalty corners to the Gophers’ measly 2, as well as outshooting their opponents 26-5. Senior goalkeeper Sophia Hamilton earned her tenth win on the season and third shutout, while Anderson’s two goals brought her season total up to eight, and her point total up to 18 on the year. Anderson commented on the importance on the Landmark victory after the game. The Catholic team looks to continue its streak of dominance as they stay on the road at Moravian this Saturday, October 14th at 1 PM.